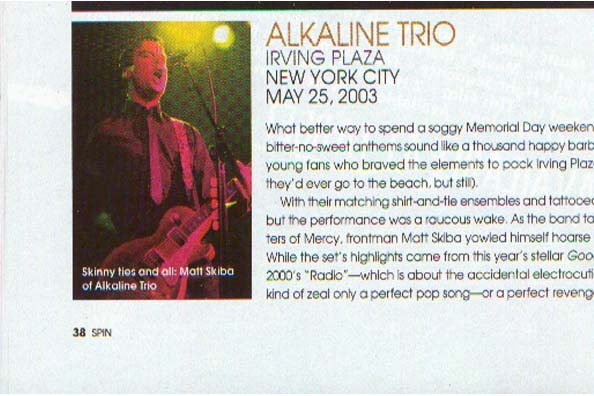 What better way to spend a soggy Memorial Day weekend than an evening with Alkaline Trio?? The groups all-bitter-no-sweet anthems sound like a thousand happy barbeques snuffed out by rain. But to the pale, black-clad young fans who braved the elements to pack Irving Plaza, an Alkaline show is a day at the beach (not that theyd ever go to the beach, but still). With their matching shirt-and-tie ensembles and tattooed arms, the Trio came dressed for a punk-rock funeral, but the performance was a raucous wake. As the band tapped veins connecting the Replacements to the Sisters of Mercy, frontman Matt Skiba yowled himself hoarse on songs about playing in blood and Armageddon. While the sets highlights came from this years stellar Good Mourning, the number that went over biggest was 2000s Radio- which is about the accidental electrocution of an ex-girlfriend. The crowd responded with the kind of zeal only a perfect pop song- or a perfect revenge fantasy- can inspire.